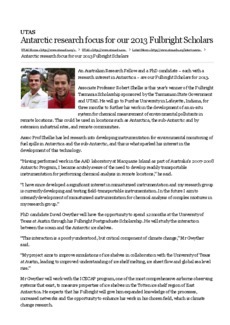 An Australian Research Fellow and a PhD candidate – each with a research interest in Antarctica – are our Fulbright Scholars for 2013. Associate Professor Robert Shellie is this year’s winner of the Fulbright Tasmania Scholarship sponsored by the Tasmanian State Government and UTAS. He will go to Purdue University in Lafayette, Indiana, for three months to further his work in the development of an in-situ system for chemical measurement of environmental pollutants in remote locations. This could be used in locations such as Antarctica, the sub-Antarctic and by extension industrial sites, and remote communities. PhD candidate David Gwyther will have the opportunity to spend 12 months at the University of Texas at Austin through his Fulbright Postgraduate Scholarship. He will study the interaction between the ocean and the Antarctic ice shelves.